Ed Sheeran has unveiled 5, the first-ever US release of five legendary EPs originally self-released by the GRAMMY® Award-nominated singer/songwriter himself, available both individually and collectively, as a special bundle via iTunes. 5– released via Atlantic & Gingerbread Man Records, Sheeran’s own recently launched label imprint – includes 2009’s “YOU NEED ME,” 2010’s “LOOSE CHANGE,” “SONGS I WROTE WITH AMY” (featuring collaborations with Welsh songstress Amy Wadge, co-writer with Sheeran of the worldwide smash single, “Thinking Out Loud”), and “LIVE AT THE BEDFORD,” as well as 2011’s breakthrough “NO. 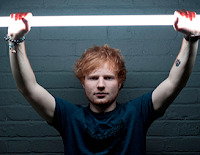 5 COLLABORATION PROJECT.” Among the five EPs are classic songs later re-recorded for Sheeran’s history-making debut album, 2011’s RIAA platinum certified +, including “Wake Me Up,” “The City,” and “You Need Me, I Need You”. Sheeran will spend his summer on tour, with the current sold out North American leg, which kicked off last week with a sold out show at the Frank Erwin Center in Austin, Texas. The dates are highlighted by a blockbuster four sold out New York area shows; two nights at the famed Forest Hills Stadium (May 28th and 29th) followed by one night each, at the Prudential Center (May 30th) and the Barclays Center (May 31st). In addition to this, the trek includes a pair of sold out shows at both Los Angeles’ iconic Hollywood Bowl (June 24th and 25th), and Denver’s iconic Red Rock Amphitheatre (June 29th and 30th). Other highlights include top-billed performances at Las Vegas’ Rock In Rio USA on May 15th and Milwaukee’s Summerfest on July 3rd.